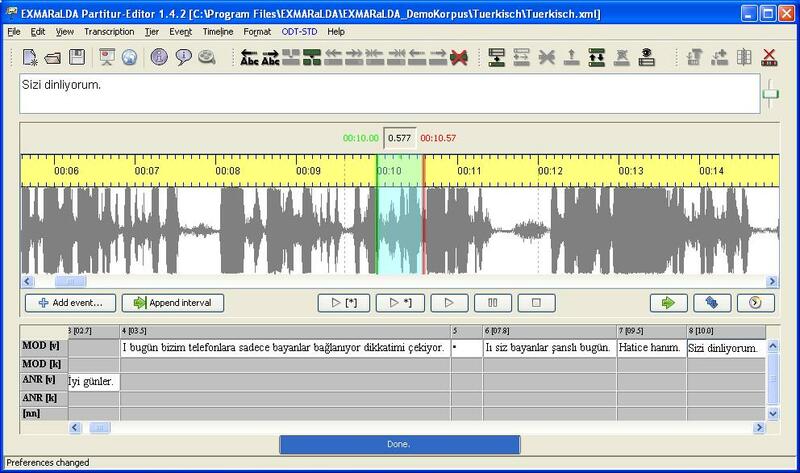 METU Spoken Turkish Corpus Project, uses EXMARaLDA Software Suite for transcription, annotation, corpus analysis and management. Being developed at the Hamburg University, EXMARaLDA (Extensible Markup Language for Discourse Annotation), is a set of sofware tools, concepts and data formats used to transcribe and annotate spoken interaction, analyze and manage resultant spoken metadata and corpora. The unique property of the EXMARaLDA is, using it’s editor (Partitur Editor), similar to sheet music notation, one can transcribe and analyse speech on time aligned cells. 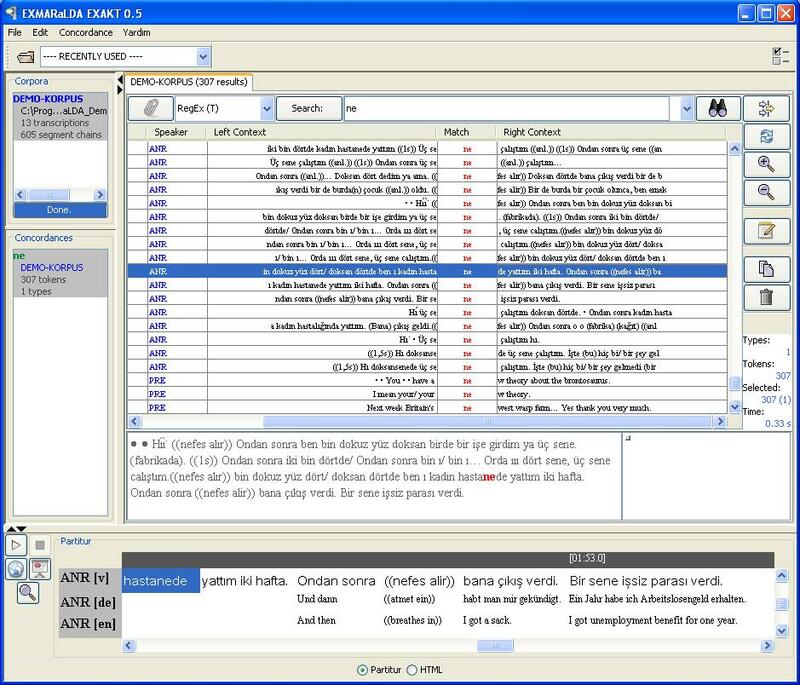 EXMARaLDA suite have all the necessary tools for creating and managing spoken corpora data which again makes it very distinctive. Developers of EXMARaLDA, Thomas Schmidt and Kai Wörner of Collaborative Research Center “Multilingualism” at Hamburg University also works for the METU Spoken Turkish Corpus Project. EXMARaLDA suite includes Partitur Editor for transcription, Corpus Manager (CoMa) for managing corpus metadata and advanced corpus query tool EXAKT. EXMARaLDA uses XML file format and compatible with many other transcription conventions such as HIAT, DIDA, GAT, CHAT. Transcriptions can be exported to HTML, PDF, RTF formats which makes it easier to share and visualize the transcriptions and analyses. XML file format ensures interoperability with other transcription systems (e.g. Praat, ELAN, TASX Annotator) and long-term archiving. Being Java based, EXMARaLDA programs may run on all platforms (Mac, Linux, Windows).